Self-esteem is said to be a fundamental and pervasive human need. Humans are motivated to maintain high self-esteem and engage in efforts to protect their self-esteem when it comes under threat. High self-esteem is a positive personal resource and is generally related to a wide range of positive life outcomes. It is therefore important to consider factors that may enhance self-esteem. Here, we argue that mindfulness may be useful to cultivate self-esteem and, in particular, secure self-esteem as opposed to fragile high self-esteem. We begin with an overview of the benefits of healthy self-esteem and costs of low self-esteem. We then argue that individuals high in dispositional mindfulness may have greater capacity for secure high self-esteem. Evidence from clinical and experimental studies examining associations between mindfulness and self-esteem is reviewed next. 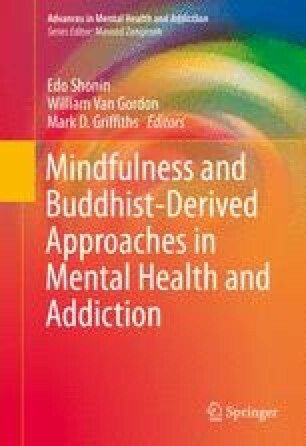 We conclude with a discussion of the use of mindfulness-based interventions for the cultivation of healthy self-esteem and an outline of directions for future research. I am now going to take you through a 15-min guided mindfulness meditation. The purpose of this meditation is not necessarily to feel more relaxed or calm or better than you did at the start of the meditation but to just simply practice mindfulness. So, taking a few moments now to settle into a comfortable position, wiggle into a position so that your back is straight but not rigid. Place your feet squarely on the ground. If you wear glasses, you may like to take them off, and gently close your eyes if you feel comfortable doing so. And if not, just find a spot on the floor to focus on. Feel all the points of contact between your body and the chair and just settle into the stillness. Let’s begin by just noticing that you can feel your feet on the ground. Notice that you can feel the bottom of your feet in your shoes. Just settle into this… bringing attention now to the feeling of the palms of your hands, and either paying attention to what you’re touching or the feeling of contact or perhaps the feeling of the air or the temperature of the air on your palms. And just bring all your attention and awareness to this part of the body. And now shift your attention to the sensation of breathing. We’re not trying to change the breath in any way. It doesn’t have to become deeper or slower or calmer. Just pay attention to the breath as it is in this moment. Throughout this meditation, we will be using the breath as an anchor. So, every time you find that your mind wanders, you start thinking or responding to sounds or thoughts as they arise; every time you notice this, just time and time again, bring your mind back to the breath, that is, your attention back to the breath. And so now for the next few moments, just sit and bring your attention to the feeling of the in-breath and the feeling of the out-breath. Hold in awareness that part of the body where the breath feels most vivid or strong for you. It might be your abdomen or your chest or nose or throat. Just bring all your attention and awareness to that part. Every time you find your mind has wandered, just gently bring your attention back to the breath. You may already find that your mind has wandered, and your mind is just doing what minds do. You may be noticing thoughts about the meditation, whether you are doing it right or whether this is boring. You may have thoughts about how relaxing or calming this feels. No matter what your thoughts are, just know that they are thoughts; they’re mental events that come into the mind, and just as easily, if you leave them well alone, they will also go out of your mind and be replaced by more. You may be noticing bizarre or random thoughts. You might be planning what you will do for the rest of the day or tomorrow. The purpose of a mindfulness meditation is not to stop your thoughts or suppress them or resist them or get rid of them. It’s just to know that you’re thinking. And then shift your attention back to the breath. So, your thoughts become like background chatter—like a radio going in the background—they are there; your mind is chattering away, and you are just not getting caught up with it. Just notice your breathing and what is happening in the present moment. So, just bring your attention to where the mind is now. And if you need to come back to the breath, then gently bring your mind back. You may also like to notice the reactions when you find that your mind has wandered when you bring awareness to the focus of the thoughts. Perhaps, you have a reaction that you don’t want to be having this thought or you shouldn’t be having this thought at the moment. Perhaps, if you are finding it difficult for your mind to settle that it shouldn’t be this way or that this is hard, just notice those thoughts as thoughts. Your mind is giving a commentary of what it is thinking at the moment, nothing more and nothing less. The thoughts are not necessarily true, are not necessarily things to be believed, and are not necessarily things to be acted upon. Just let the thoughts do their thing, and just bring your attention back to the breath, no matter what your thoughts are telling you. So, breathe in and breathe out… just simply observe the breath, in this moment…. And now in this moment…. Just breathe in and just breathe out. Being aware of everything that is happening, in each moment, as it passes, your thoughts are going to be there whether you want them to be there or not. So, sometimes you may as well just let them. But bring your attention to the experience of breathing in and breathing out, and let your thoughts come and go as they will. And you may be noticing themes to your thoughts—these are the “hard and boring” thoughts. These are the “planning” thoughts. Just when you notice the theme of the thoughts, just remember they are just thoughts too, and bring your attention back to the breathing. You may be also becoming aware of feelings and sensations as you’re sitting for this amount of time. You may be noticing themes of discomfort or itches as you sit. See if you can experience these just as sensations. You may notice thoughts like this really hurt or this is unbearable or I have to scratch. And again, just because they’re thoughts doesn’t mean they are real or that you have to obey them. Just be willing to experience it—be open to allowing it to be there. Hold these sensations in one part of awareness and focus on the breath at the same time. And observe your mind’s reaction. Perhaps, your mind is irritated. Perhaps, your mind is telling you to scratch or to move. And if you do decide to move, or to itch, just do so mindfully. And then just come back to the breath, and allow things to be just as they are. Just breathe in, and just breathe out. Let thoughts and sensations just enter awareness and then leave awareness. And continue to focus on your breath. So, mindfulness is awareness of everything that is happening in the present moment. Just allow it to be there. Be willing to have the experience you are having. And just breathe in, and just breathe out. Be aware of whatever is happening in the present moment. If you find you’re lost in thoughts, just notice where your mind went, and bring your mind back to the breath. You might find that the background chatter gets less, or maybe it doesn’t. Regardless of what’s happening… just come back to the breath. And now bring your attention and awareness to the feeling in your body on the chair and all the points of contact between you and the surface. And now, just notice that you can feel your feet on the ground. Notice that you can feel the bottom of your feet in your shoes. Then bring your attention to the palms of your hands. Whether they are touching the chair or your body or whether you can just feel the temperature of the air on them… just bring your attention to the palms of your hands. Now, gently bring your attention and awareness of the room around you. And when you’re ready, open your eyes, and come back to the room. Script used in Study 2 reported by Pepping et al. (2013). Zeigler-Hill, V. (2006). Discrepancies between implicit and explicit self-esteem: Implications for narcissism and self-esteem instability. Journal of Personality, 74(1), 119–144. doi: 10.1111/j.1467-6494.2005.00371.x.